When you’re decorating your home on a budget, you have to be creative about how and where you shop. That’s why I love hitting up antique stores, thrift stores, garage sales and events like The Brick’s Tent Sale for low cost decor items for our house. At sales like this, you can often find really unique pieces for a fraction of the cost of things you’d find elsewhere, and I love the idea of hunting for treasures! Today I want to show you how I decorated a traditional glam bedroom with pieces from The Brick‘s Tent Sale, and share with you how to create a cohesive decor look from thrifty finds. 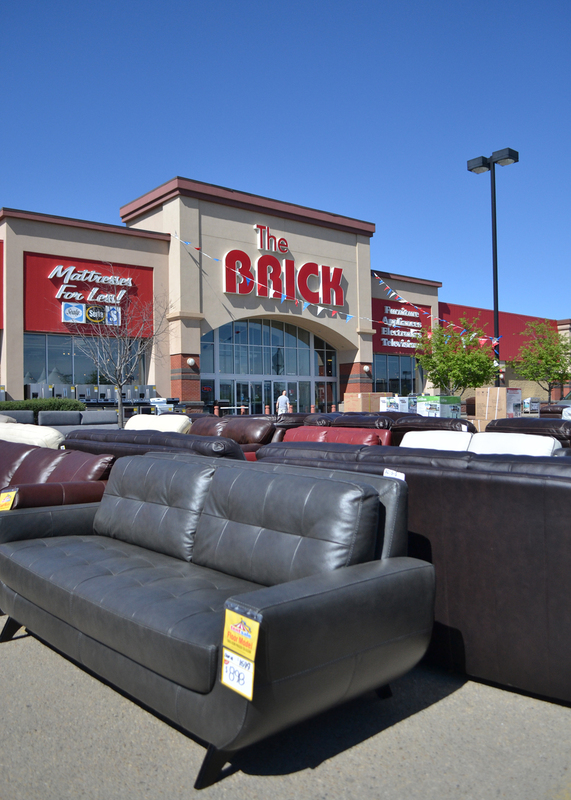 The Brick’s Tent Sale happens each May and September and it’s such an awesome sale to check out if you’re looking for new decor goodies! Each store’s parking lot is filled with different items, so it’s like one big treasure hunt. You’ll find discontinued items, floor models, and scratch and dent items at a huge discount, so it’s a great place to shop if you’re on a budget. I shopped at the Tent Sale at The Brick in South Edmonton Common, and found a whole lot of pieces for a master bedroom design. A gorgeous tufted headboard in a lovely creamy colour was my inspiration for this look: traditional glam. 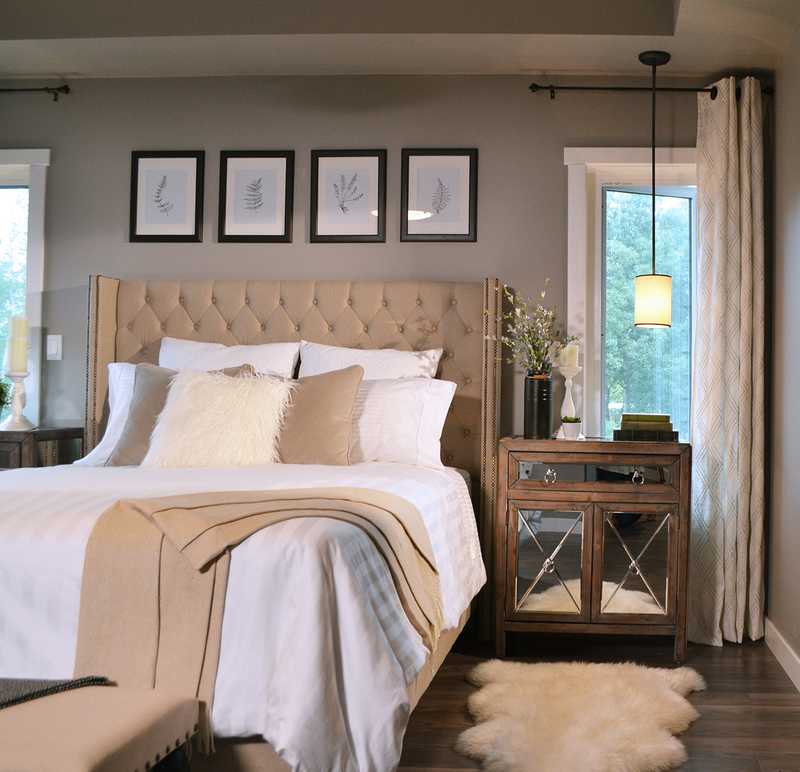 The mirrored cabinets acting as nightstands give this space the the “glam” factor, as do the DIY throw pillows in faux fur and velvet. The bedroom gets a traditional vibe from the symmetrical artwork above the bed and the subdued, monochromatic colour scheme. 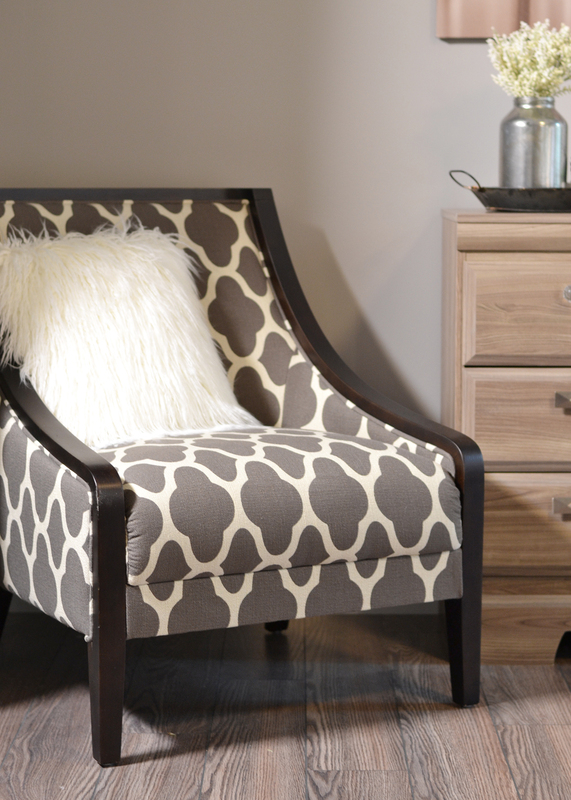 A patterned slipper-style chair from the tent sale is the perfect piece to accent the bed! Vintage accessories and small items I had on hand help pull the room together. So, how do you make a room look cohesive with thrifty finds? Here are my tips. 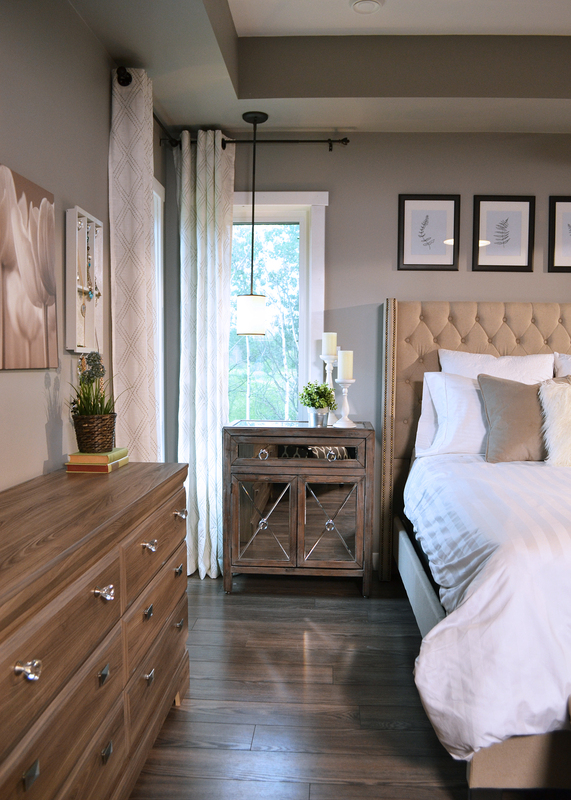 If you don’t already have a theme in mind, start the decorating process off by looking for an inspiration piece that will set the mood of your room. It should be something that jumps out at you and makes you say, “I LOVE IT!”. 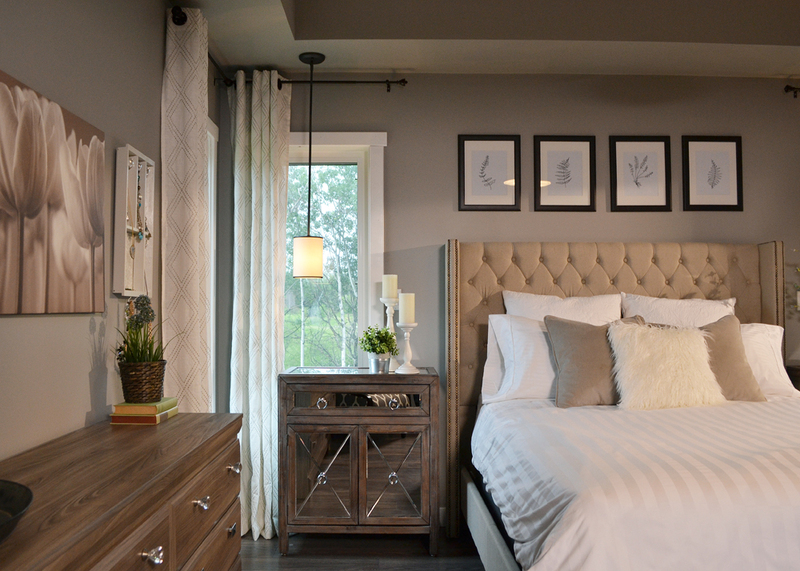 In this case, we stumbled across this gorgeous, tufted headboard that I absolutely adored. It screamed traditional glam, so now I knew the look I was going for when searching for the rest of the items for this bedroom design. Your inspiration piece might be something as large as a headboard, but it might also be a painting or accessory with a style or colours that you love. When searching for discount pieces, try thinking creatively about how items could be used. 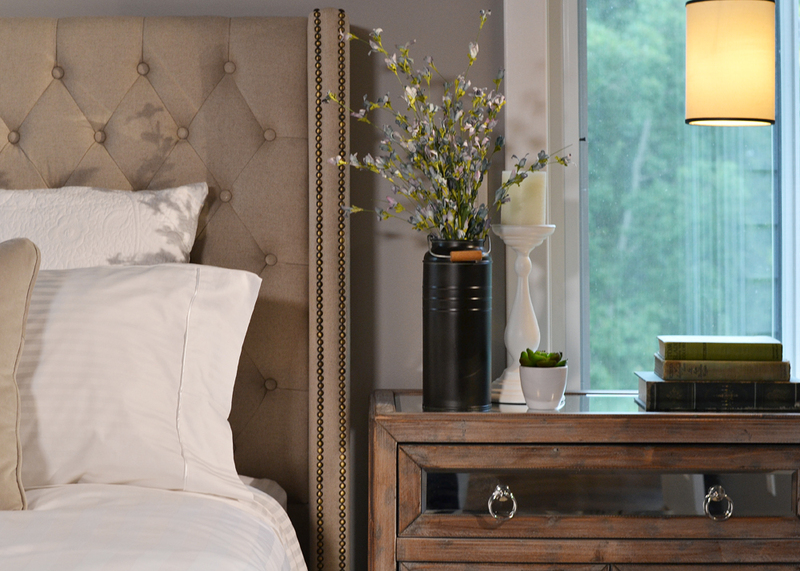 That cabinet or side table meant for a living room could also work wonderfully as a bedroom nightstand! That TV stand could work well as a buffet table or bedroom cabinet. Using furniture in a non-traditional way can save you some money and make your space look really unique! Don’t be afraid to DIY. 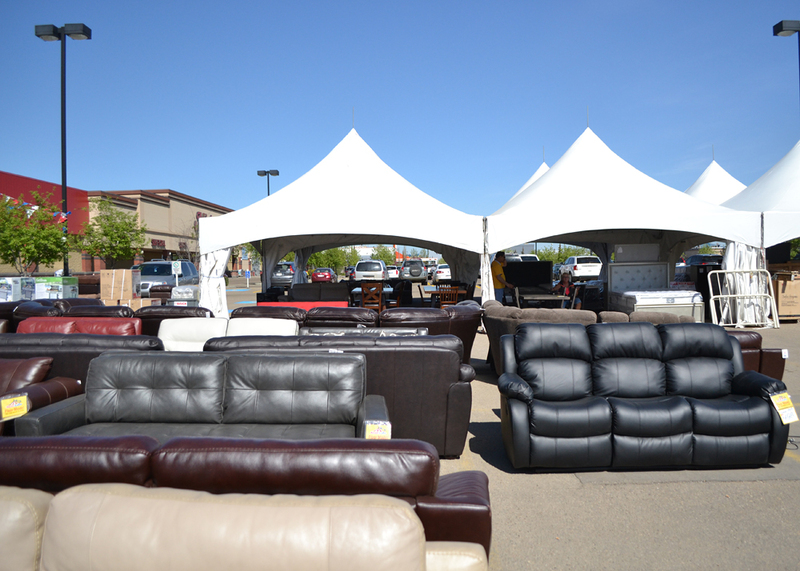 At Tent Sales, you might find pieces that are slightly damaged or missing things like hardware. It’s really easy to paint a piece with chalk style paint or add new knobs. In my case, I found a beautiful dresser that I thought would look great in this bedroom, but it was missing a few knobs. I spend a few dollars on some glamourous crystal knobs, added them to the top drawers, and the dresser is now not only functional but more customized! DIYing can also help pull all of your finds together when you’re styling your finished space. I finished off this room by making some curtains and throw pillows in cream and grey to tie the bed and furniture colours together. You can find my throw pillow DIY instructions here and my drape instructions here. The artwork above the bed is also handmade. I simply sketched some fern leaves on white paper with a black marker and framed them. Easy! Do you have any furniture bargain hunting tricks? I’d love to hear them! Happy Hunting! Love it! Can I ask what colour paint that is on the walls? I think we have the same laminate floor as you and I am struggling with the paint colour we’ve chosen.